Part I - those hosted by the Larkspur and Corte Madera Fire Departments. Getting into water fights probably started long ago in the days of bucket brigades or even earlier. Once the fire was out, there's no doubt that some would have chosen to dump or spray water on each other, especially if they were hot. 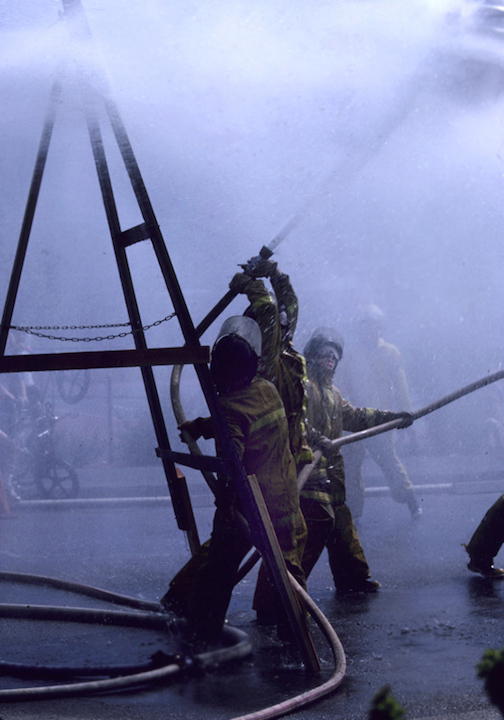 We know of several types of water fight competitions in Marin County fire history. This feature will focus initially on those hosted by the Larkspur FD in the 1940's, 1960's, 1970's, and 1980's. We are focusing on Larkspur because we have some great photos and video to share. We also know of other FD's having competitions, including Kentfield Fire Protection District, Novato, and Alto-Richardson Bay. Both Kentfield and Corte Madera competed with Larkspur in the earlier era's, and many competed in the Larkspur Fire Muster in the late 70's and 80's. The competitions in the 1940's were the most dangerous. These took place on Locust Ave., one block west of the Larkspur FD station on Magnolia Ave. Imagine two fire department engines loaded up with firefighters in the cabs and on the tailboards. They faced each other about two blocks apart, and then raced towards each other at a pretty good speed. They passed each other mid-way on the street, and started a long reverse hose lay with a single 2.5" line to a hydrant about three blocks away for each. Once the line was charged, the teams took up position on the nozzle end of the hose with a straight tip nozzle, wearing turnout coats, and what looked like World War II aviator caps with goggles. Scroll down to watch the video footage of one of these events, in this case with Corte Madera FD. 1960's Era - Larkspur vs. Corte Madera at the Corte Madera Town Center, and the Town Park. These were usually held as part of the larger 4th of July festivities held in the "Twin Cities." Competition included a softball game and water fight. Story coming soon. 1970's Era - Larkspur vs. Corte Madera at the Corte Madera Town Park. Competition included not only the water fight, but also a tug-of war, with the dividing center line being an open 2.5' hydrant outlet flowing water, through which the losing team would be dragged. Story coming soon. 1977-1984 - The Larkspur Fire Muster. This regional competition included teams from Marin County and other counties. Events included a water fight, obstacle course, hose cart and hand pumper event, bucket brigade, the tuna hose clamp 2.5" charged hand line extension, a pie eating contest, Chief's event with spouses, and more. Story coming soon. 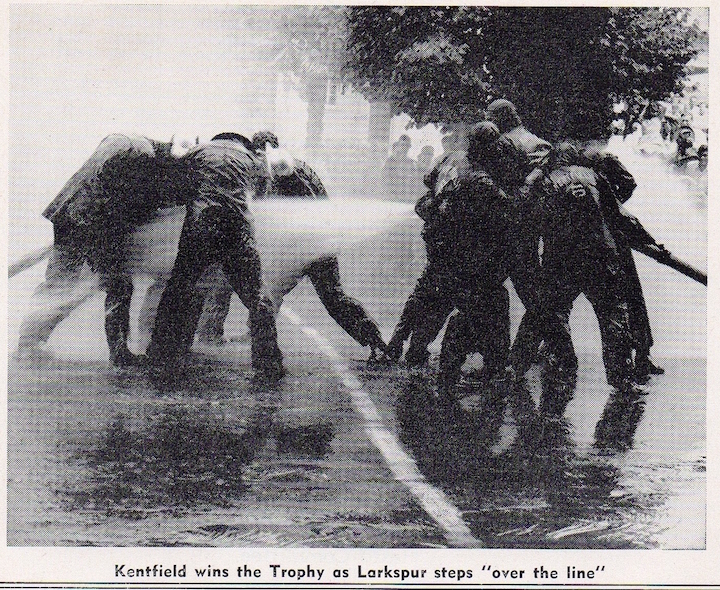 A water fight held on Locust Avenue in Larkspur between Kentfield FD and Larkspur FD in the 1940's, using 2.5" hand lines and straight bore nozzles. Photo courtesy of Larkspur Volunteer Fire Foundation historical collection. This video footage from the 1940's we believe was shot by Arthur Wedemeyer Sr., but it's only a guess. He was once the Mayor of Larkspur, and you can read more about him on his son's page under the Special Recognition and Awards section. The footage from the early 1980's was shot by Paul Weichel, retired Larkspur firefighter now deceased. Paul was an early adopter of the use of VHS, which in it's early days required he wear a full backpack of gear to film. Look forward to a biography on Paul. The footage is courtesy of the Larkspur Volunteer Fire Foundation historical collection and the Weichel family. Click on the symbol to the lower right between the HD and vimeo to see full screen. Larkspur FD Waterfights 1940s 1980s from Tom Forster on Vimeo. The Diamond Springs FPD Muster Team competing in a water fight during the Larkspur Muster around 1980. Two teams with two 1.5" handlines each would compete to push the spinning beer barrel to the end of the line on the other team's side, best of five. Photo courtesy Tom Forster.